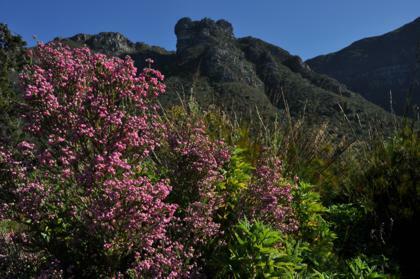 The Erica Garden features a selection of the approximately 770 species of Erica that occur in southern Africa. Ericas are commonly called heaths or heathers and are familiar to many of our visitors from Europe. It may surprise them to learn that southern Africa is home to nearly 90% of the world’s Erica species, and most of them occur in Fynbos. Europe has only 21 species. Ericas provide colour and interest throughout the year, but the peak flowering season for many of them is during spring and summer (August-February). Ericas show an astonishing variety of flower shapes and colours, including scarlet, pink, white or bi-coloured tubes, and pink, lilac or white urn- or bell-shaped flowers. 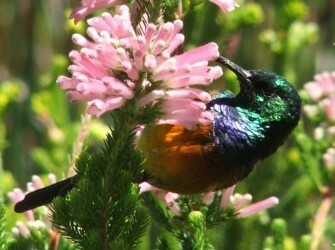 The species with brightly coloured, tubular flowers attract sunbirds in search of nectar, and the bell- and urn-shaped flowers attract bees and other insects.